More Nine Inch Nails than Mount Rushmore, the upcoming Sochi Olympics will feature a new giant pinscreen that renders impressions of the faces of visitors to the Games. The pavilion for Russian mobile phone giants Megafon will play host to the installation, which was designed by British architect Asif Khan. 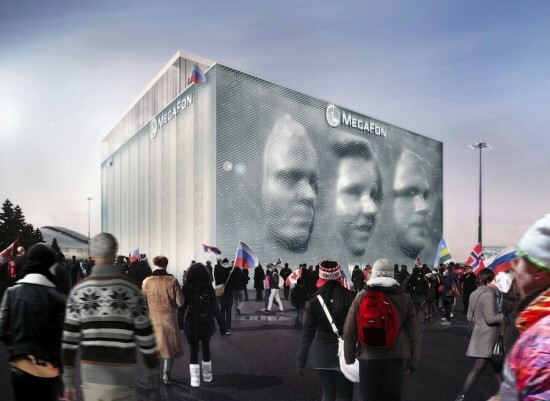 "Megaface" will display three faces simultaneously, each measuring 20 by 26 feet. Every 20 seconds the images emerging from the wall will change, an interval that will allow some 170,000 unique faces to grace the facade of the building during the two-week duration of the Olympics. Khan worked closely with Swiss company iart, who developed the technology that makes such a spectacle possible. 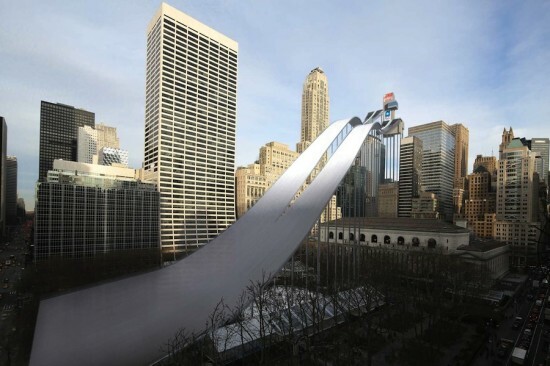 10,000 telescopic cylinders capable of extending over 6 feet combine to form the facial images. Each "pin" is tipped with an led light that shines through a thin sheet draped over the facade that flexes as the images materialize. The source for the three-dimensional portraits comes from on-site photo-booths capable of making 3-d facial scans. Those who make an appearance on the wall will be sent a link depicting their visage emanating from the side of the pavilion.